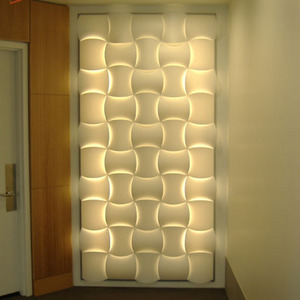 These Ecoresin panels are beautifully translucent, and illuminate with color and light. They are produced from a non-toxic polyester resin, which is easy to clean and has 40X the strength of glass. They can be used as countertops, wall panels, doors, integrated into cabinetry, and in many other ways. At the end of their life cycle, 3Form will reclaim them for re-use and recycling.